Erin is one of many Red Crossers on the ground in San Bernardino responding to the massive Blue Cut Wildfire. The wildfire, which started on August 16, 2016, charred over 37,000 acres and destroyed hundreds of homes and outbuildings. Red Cross shelters have housed hundreds of evacuees. Volunteers have worked around-the-clock to provide food and water, emotional support, health services, casework, logistics and more. A large disaster like this creates more needs than any one organization can meet and the Red Cross is working closely with the entire response community – federal, state, county and local agencies, other non-profit organizations, churches, area businesses and others – to coordinate relief efforts and deliver help quickly and efficiently, keeping in mind the diverse needs of the community. Even as the Red Cross is continues to provide emergency relief, trained volunteers are already at work creating community recovery plans. Caseworkers are beginning to provide personal support to survivors, meeting one-on-one to help those affected by the fire create recovery plans, navigate paperwork and locate help from other agencies. In some situations, the Red Cross may provide direct financial support to people who need extra help. For victims of disaster, the road to recovery is often long and difficult. In the coming days, Red Cross volunteers will continue to canvas affected areas to bring aid to those who may need help. The process of rebuilding can often take days, weeks, or months- sometimes even years. The Red Cross will be there every step of the way. The Red Cross relies on donations to help disaster victims. You can help people affected by disasters like wildfires and countless other crises by making a donation to support Red Cross Disaster Relief. 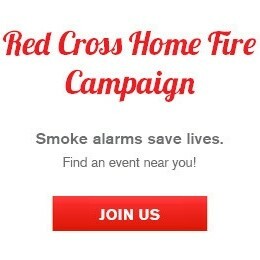 Click, call or text– visit redcross.org, call 1-800-RED CROSS or text the word REDCROSS to 90999 to make a $10 donation.